Don’t Set A New Year’s Resolution To Get Healthier. Do This. People who attend the group exercise classes that I teach often tell me that they avoid them in January since they know the classes will be more crowded than usual. “I’ll see you in February,” one man once said to me in late December. “The New Year’s Resolutions crowd will be cleared out by then,” he added. At the start of each year, many people resolve to “get healthier.” Whether you want to lose weight, add muscle, eat better, drink more water, drink less alcohol, or exercise more often, chances are that you (or someone very close to you) set some sort of New Year’s Resolution this year to get healthier. Unfortunately, research has demonstrated that over 90% of all New Year’s Resolutions will be unsuccessful. This article will highlight why most change efforts fail and how you can be among the few who succeed in making healthy changes stick. Why do most people fail with their New Year’s Resolutions to get healthier? There are two main reasons why most most resolutions to get healthier will fail. First of all, the resolution to “get healthier” is too vague. What does it mean to “get healthier?” How would you or anyone else be able to tell if you made progress with this unclear objective? This ambiguity is a problem because it can destroy your motivation. When you aren’t sure if you are making progress, it can be very tempting to give up and stop trying to improve. The improvised approach: With this method, there is no strategy. You just try to make healthier decisions whenever (a) you recognize an opportunity to be healthier and (b) when you are in the mood to make the healthier choice. 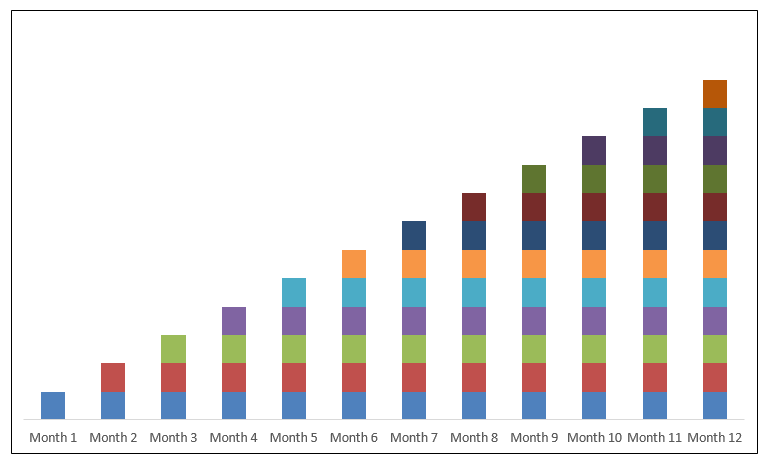 The overhaul approach: With this method, there is a strategy, but it’s not a sustainable one. You try to make major changes at one time, perhaps by following a fad diet that is complicated and rigid, or by starting a workout program that is time-consuming and extreme. If you want to get healthier, a stronger approach is to focus on breaking, making, or expanding one specific habit at a time. Commit to stop doing or start doing one specific behavior every day (or at least five days a week). I refer to this as the fail-safe approach to get healthier. Figure 1. This image represents your progress in getting healthier when you break, make, or expand one new habit each month for a year. Each color represents a separate healthy behavior. If you frequently drink beverages with extra calories, added sugar, or preservatives (i.e. alcohol, sweetened iced teas, sodas, or energy drinks), you could commit to replacing one or more of those beverages each day with 12 ounces of water. If you usually skip breakfast or eat a low-value breakfast like a bagel with cream cheese, you could commit to eating a natural, nutrient-dense breakfast every morning instead. Aim for at least 20 grams of quality protein, at least one serving of fruits and vegetables, and no added sugar or artificial ingredients. If you are not exercising consistently, you could commit to exercising for 20 minutes before, during, or after every workday. You can increase or decrease the size or complexity of these sample behaviors, or any other behavior that you decide to adopt. Someone who already has many healthy habits would focus on different and more complex behaviors than someone who currently has very few healthy habits. Have you identified one specific behavior to focus on first? Your selected behavior should be specific enough that anyone could determine whether you did it or avoided it each day. Will your new behavior take less than 30 minutes (max) a day? For example, if you aren’t exercising at all right now, you are much better off starting with 20-minute workouts, rather than immediately trying to start with 60-minute workouts. You could always expand your habit and increase your duration in the future. What if you want to make more than one change now though? Let’s say that the first habit that you want to focus on is exercising for 20 minutes before every workday. The fail-safe approach does not prevent you from making additional healthy choices on a daily basis. For example, you could certainly also start drinking more water and start reducing your consumption of artificial foods. However, consider any effort beyond your selected habit as a bonus. The positioning here is very important, or you can easily fall into the trap of the overhaul approach. Don’t require yourself to break, make, or expand multiple behaviors simultaneously. It’s better to start small and build momentum and confidence, rather than biting off more than you can chew and potentially being overwhelmed after just a few days or weeks. Whenever a behavior starts to feel easy and automatic (when it becomes a habit), you can then identify an additional healthy behavior to incorporate into your life next. 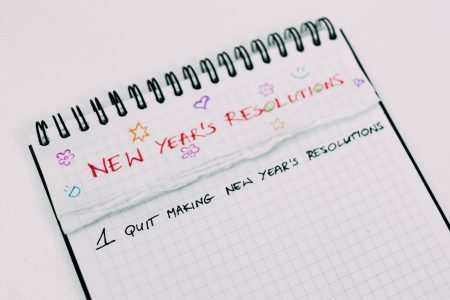 Research has estimated that over 90% of all New Year’s Resolutions and change efforts eventually fail, and over 25% of resolutions don’t even last one week. Don’t set a New Year’s Resolution to get healthier. Instead, focus on adopting one specific change at a time. Follow the fail-safe approach to get healthier, and the next year can be your strongest, healthiest year ever. “New Years Resolution Statistics.” Statistic Brain Research Institute, https://www.statisticbrain.com/new-years-resolution-statistics/.